A couple of months ago, a friend & I walked into a clay shop and before me were (what seemed like) endless options of clay items that I could paint. A Sloth. Plate. Box. Mug. Any animal. Ya know, all the things. The list goes on and on. After debating and picking up many items and then placing them back on the shelf due to my indecisiveness, I opted for a coffee mug. However, the process really just began at this point. From there I received the quick run down, things to do/not to do to help make for a smoother time and better finished product, including the encouragement to put on an apron since it was bound to be a messy adventure. Next, I stared at all the color choices. I’m pretty sure they had every color shade imaginable, with or without sparkles of course. At last, every decision I needed to make was complete and it was time to sit down and paint. I took a deep breath and began. I knew the general idea of what I wanted the final product to be, but I was oblivious to what the journey would be to get there. Ya know, paint bottles that didn’t want to disperse paint. Paint smudges. Running out of a specific color. Smeared words. But as I pushed through and continued on, I started seeing it all come together. Finally, I arrived at what seemed like the end but that was the point when I had to leave my mug behind so it could be glazed and go through the fire...it had to be transformed just a little more so that it could truly sparkle and shine. The overall theme displayed on my mug became a great representation of the overall experience and it sure does apply to the journey I’ve personally been on, and perhaps you have, also...either now or at another point in your life. 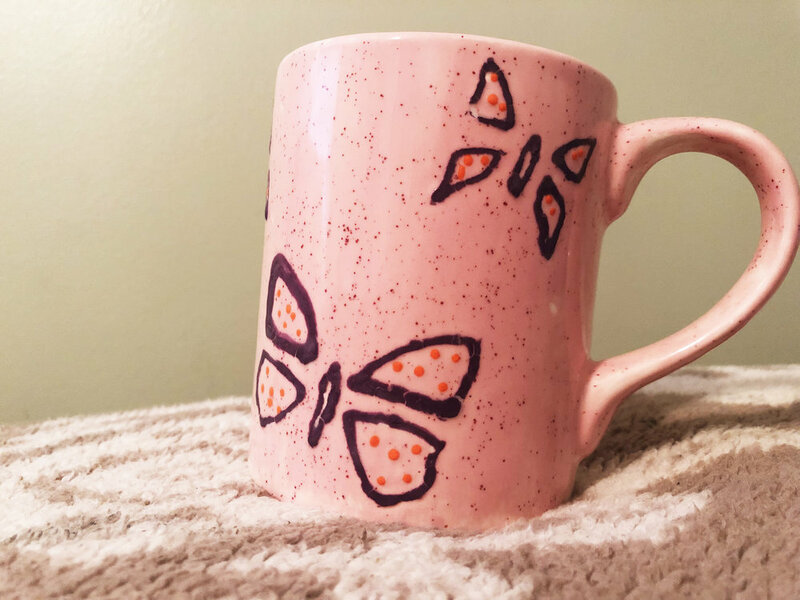 Just as a caterpillar goes through the process to transform into a beautiful butterfly, and like the process I walked through with my mug, we each go through a process as well when we’re being refined and transformed into the best version of ourselves. Does it happen over night? Absolutely not. Is it messy at times? Sure thing. Are there things along the way that represent smudges or smeared words? Oh sure there are. But is it worth it to give yourself time and see what comes from it? You bet. You’re a beautiful work in process, and you’re worth every single second it takes. 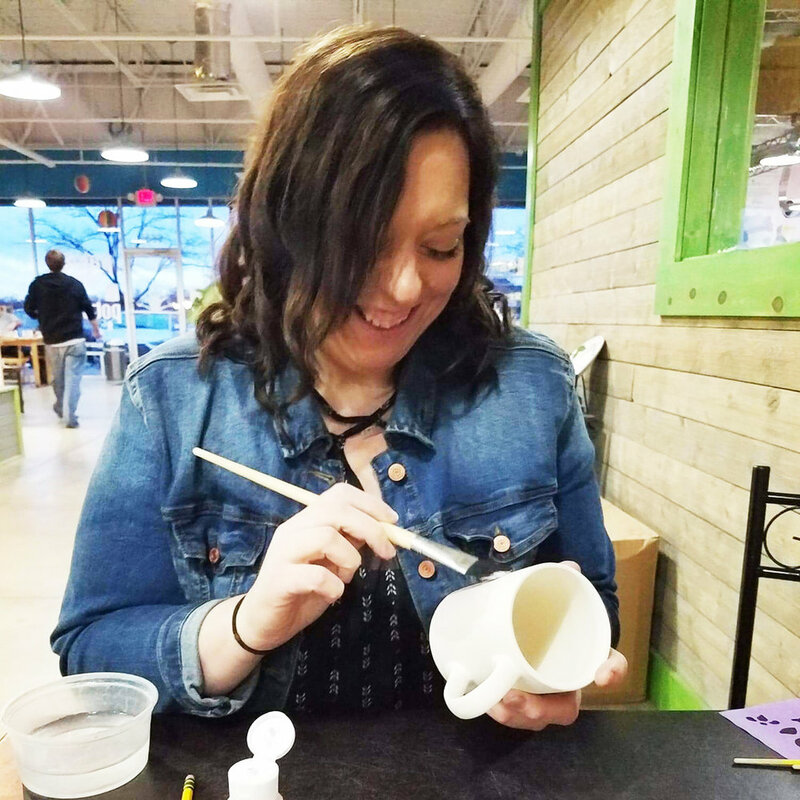 You can usually catch me singing along to most any song that comes on, sipping a chai tea latte at a local coffee shop, or enjoying time outdoors which is where I connect with God the most!